Every investor should understand the process used to make investment decisions in any method he or she is considering following. This piece lays out the major components of the method used by the models in the Advisor 401k Newsletters. Our goal is not to get every ounce of potential return without regard to the amount of risk taken. If you're ok with experiencing every ounce of return and every ounce of risk, you're better off just using index funds. You will capture 100% of every market rally and 100% of every market decline. Believe it or not, some investors can live with those outcomes – or simply don’t care about potential losses. We do care passionately about avoiding losses. While you cannot avoid 100% of the losses in the markets, you can certainly avoid a lot of the major drops with proper planning. If you capture a lot of the return on the way up and avoid a lot of the losses on the way down, you will come out ahead – and sometimes save the fruit of decades of investing. This brings up a second principle of our approach that you should understand. It does you little good to have great returns on the way up only to see them crash and burn on the way down. To succeed on a long-term basis, you must keep your gains. Everyone talks about making money in the markets. We want to make money too. What differentiates our process from that of so many others is that we talk about the one thing that few others ever really talk about – KEEPING IT. The way we do this, though, is very different than what you get with a standard “asset allocation program”. Most of these programs own a variety of asset classes and then “rebalance” them quarterly or annually. They too, have transactions – they don’t buy and hold forever. Their view is that an advisor should “buy the market” and hold on through whatever comes. Our approach is based on a different view of reality. The best way to explain this is visually. 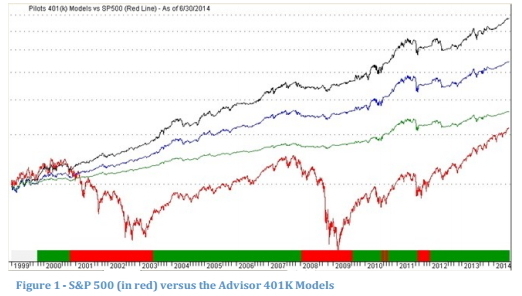 This is a picture (same one as on the cover) of the 15-year results of the S&P 500 (in red) versus the three portfolio models in our method. Take a hard look at the difference and then we’ll continue. The stock market, here represented by the S&P 500, is much like the weather you might encounter on a flight. Sometimes it helps you, sometimes it hurts you a little, and sometimes it creates a serious risk to you and can hurt you a lot. The approach of the typical asset allocation program is to own the weather. The “financial weather” doesn’t know your goals any more than the real weather knows the destination of your aircraft. Why would you forfeit control of your financial future to the vagaries of the market "weather" any more than you would rely on the actual weather to get your flight to the correct destination? Weather has no intelligence. It just is. Weather is definitely not on your team. The “financial weather” has risks that can be a real danger to your financial health, just like real weather can be a danger to your physical health. When you use the asset allocation approach alone, you may be modifying your holdings and results somewhat from just owning the S&P 500, but often when the stock market goes down, a lot of other asset classes go down as well. This is especially true lately. If you “own the weather”, you will experience the frothy tops, and the crushing declines, and the dismal bottoms. You will be held hostage to events you have no control over and your future will depend on those events. We would ask: Why would you want to do that? If asset allocation alone is the best way to invest, why are so many pension plans that subscribe to an asset allocation discipline underfunded as a result of huge losses they've sustained recently? They are among the largest subscribers to an asset allocation strategy and yet they've failed time and again to protect the money of their plan participants. You can see (in the chart above) the Advisor 401k method flies through the weather. Does this approach work? Look at the chart. Does it outperform the “weather” in every instance? No. But that shouldn't be your goal. Your goal is to arrive at your chosen destination safely and on time. The expression “a rising tide raises all ships” is a great picture of what can happen in the stock market. It could also be said, “a falling tide lowers all ships.” It's important to be in the right type of ship for the tide. Rising markets are often referred to as Bull Markets. Falling markets are referred to as Bear Markets. Being able to identify what kind of market we are currently investing in is one of the cornerstones of our approach. We do not just guess at what kind of market we are in. We have a quantitative approach that measures what kind of market we are investing in today. As such, we don’t invest based on feelings, premonitions, hunches, beliefs or hopes. We invest fully in markets that are quantitatively identified as Bull Markets. We reduce or eliminate exposure to risk assets in markets that are quantitatively defined as Bear Markets. That there are different types of markets is easy to verify by simple observation. To have the same investing approach in both types of markets is, to us, foolish. The 10-year period from 1999 through 2008 has been called "the lost decade" for "buy and hold" asset allocation investors. Even the broader, 14-year period from 1995 through 2008 was virtually flat for the S&P 500. The problem is events like these 10-year and 14-year periods of virtually flat market returns occur more frequently than most investors realize. Here is a chart of the S&P 500 Index for the more than 18-year time-period through the middle of 2014. It is easy to see that there have been good markets and bad markets. While it’s important to recognize that there are different kinds of markets, to make that observation useful to us as investors, we have to quantify which is a rising market and which is a falling market. It is easy to see which is which in hindsight, but as investors, we want to know what to do now, before the trend runs its course. Rather than rely on simple observation, which can be influenced by human emotion, we use a quantitative model to identify Bull and Bear Markets. Here is the same chart again through 2014 YTD (as of 06/30/14), but we’ve now added an indicator on the S&P 500 to define when a Bull Market begins and when a Bear Market begins. It's now much easier to see that there are periods of time that can stretch for years, when it just doesn’t pay to be fully invested in the stock market. There are also periods of time that can stretch for years when you absolutely want to be fully invested. There must be a way to tell them apart. We do this using several custom indicators that give a similar picture to what you see in Figure 3. Because the type of market you're investing in can influence your performance more than any other factor, this "market determination" step is always the first step in our investment process. As a side note, we do not believe in, nor do we practice market timing – The interesting thing about the term “market timing” is a lot of investors do it in one way or the other, but opinions seem to differ as to what it really is. To us, "market timing" means trying to anticipate future market moves and acting upon that. We do not do this. We believe it is impossible to accurately anticipate future market movements. There are no market crystal balls. The Advisor 401k method looks at actual data that exists in the market now and evaluates risk, investment selection, etc. It does not anticipate movement. It simply adjusts risk and exposure based on the available data. Most people in the media, and most financial planners who are quoted in the media, describe market timing as “jumping in and out of the market” based on human feelings or perceptions. We agree that relying on emotion is a poor way to invest. Unfortunately, most financial planners do not have a good method of minimizing risk other than just experiencing the full impact every time the market goes down. You need to look back no further than 2000-2008 to see the devastation this “asset allocation alone” approach brought to investors’ portfolios, as well as to so many pension funds that are now underfunded. Retirees were particularly hard hit by following the advice of these practitioners. Ask any retiree who lost 30-50% of their retirement savings. The cold comfort the financial planners gave them was simply to say that "these things happen" and the advice they gave then was to continue to hold on all the way down. The models will remain invested in these allocations until the market switches from a defined Bear Market to defined Bull Market. This waiting period is often the most difficult for investors who are easily influenced emotionally by daily market events. Bear Markets can last a long time. Bottoming and switching from a Bear Market to a Bull Market takes longer than most investors realize. Bull Markets: Once the process identifies a switch from a long-term Bear Market to a long-term Bull Market, it begins to allocate funds to increase the exposure to stocks. This is not a total 100% switch (also very different than market timing). The bottoming of a stock market can take months. This bottoming process is often volatile, with false rallies that fail, sometimes dramatically. As a new Bull Market rises from the ashes, it will gradually gain strength and eventually emerge as a confirmed, long-term, rising trend. The method recognizes that this is a process, not an event. This transition period allocation will have exposure to money market funds and/or bond funds and to stock funds and other risk asset funds. The method is fine-tuned enough to make these decisions in 1% increments. One popular “mutual fund upgrading” approach originated with a newsletter decades ago. Today, that same company has mutual funds based on the same concept. 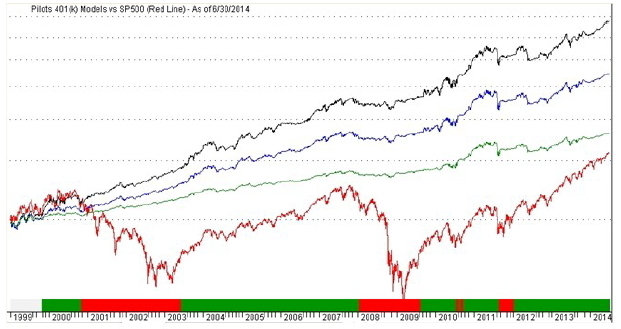 This approach averages fund performance over 4 time periods and “upgrades” the portfolio based on these rankings. This same approach was taken by other newsletter publishing firms and applied to some airline 401k funds. There are two or three such firms we know of writing newsletters for pilots that use this approach. There are some downsides to using this approach. First, you are typically “switching to the fastest horse” by choosing high momentum funds. Sounds appealing, doesn’t it, “Riding the fast horse?” Unfortunately, some horses fall, some horses go off the track, and sometimes you switch to a horse right before it begins to stumble. When there are market losses, riding the highest momentum horse is not where you want to be sitting. These two factors are combined into one composite score, which is used in identifying and ranking the Top Funds. After these funds are identified, the method calculates the appropriate position size. No matter which sectors of the market take the lead at the beginning of a Bull Market, that leadership will rotate as the market develops and matures. Our process regularly updates the fund selection to move to new leadership. The upgrading time interval depends on two factors: 1) whether your company’s 401k Plan has a required holding period, and 2) the results of holding funds for differing periods of time, as measured historically. In our research, the "sweet spot" for a holding period is about 30 days. Unfortunately, some 401k Plans require a 60-day hold, which limits upgrading to around 6 times per year. Additionally, this process produces very good results in a historical look back over 10 years with 60-day holding periods. If your company’s 401k Plan has no holding period requirement, the process will upgrade the investment holdings once every 30 days, if there were changes in the Velocity Composite Ranking. We lay out each plan’s Velocity Composite Rankings in the newsletter each month. The process uses the same technology to evaluate the fund choices for upgrading that it uses to initially choose funds when a Bull Market commences. If a fund still ranks in the top 3 or 4 among its peers (depending on the utilized allocation model), it will continue to be held. If the fund in question drops in the rankings, it will be downgraded accordingly at the next upgrading opportunity. [NOTE: Our mid-month email is simply a market update and commentary piece and will not provide any changes to the models. V. 401k Process, Customizing the Process, Etc. As described under Section III, the Advisor 401k process uses a combination of two methods to identify which investments to purchase and when to purchase them. This differs significantly from other approaches which often buy the highest momentum funds as they approach a market top, only to continue holding them during a market sell-off. The highest momentum funds are typically the funds that fall the most in a market decline. The Advisor 401k process is sophisticated enough to choose investments when they are beginning to establish a positive trend pattern after a pullback or decline. This process avoids buying a fund right at the top only to see it suffer a severe decline in value. A. 401K Process - In the original version of our 401k process, we introduced our readers to "stop-loss prices" in order to protect them from drops between issues of the newsletter. For a time, this served us pretty well. However, in 2009 we developed a better method to maneuver through the changing market while working within the parameters of the 401k plan trading rules. There is an ongoing analysis of the markets to determine when a long-term Bull Market is switching to a long-term Bear Market. When this switch occurs, the process moves the allocations into money market funds and/or bond funds as soon as possible. Remember, this is THE MAJOR determinant of total return in the long run, and the main way of preserving your gains on a long-term basis. The long-term market shifts mean you will be invested (largely) during rising markets, and out of harm's way (largely) during long-term market declines. Never in a perfect way, but that is the nature of investing. The ongoing upgrading / ranking of the investment choices available works to move your portfolio to new market leaders as they break out and begin positive trends. Over the course of a Bull Market, leadership continues to change and the process will evaluate and follow these changes – again in an automated way. Because it will upgrade to the new leaders much closer to a recent pullback or decline, there is less risk when a decline occurs again–especially when compared to a momentum- based system used by others.These two mechanisms work well together and dramatically reduce the need for using "stop loss" orders and trades. If you doubt this, please look once again at the 16-year chart on the cover of this paper which documents the outcome of the process. Would you have been satisfied with the performance of the strategies shown on the chart? With the risk level shown? Almost everyone would immediately say "yes", they would have loved to have experienced these results. Ultimately, the test of whether a process is effective is in the results. Note that the performance of the strategies shown did not depend on the use of "stop-loss" trading, but relied solely on the two mechanisms described above. By giving the process just a bit of freedom, in our testing, long-term results exceed those of using the "stop-loss" trading system. We must all recognize that there is no perfect way to invest. If there were, everyone would be doing it – especially the large money management firms. There are, however, great and proven ways to invest that can protect the downside and deliver acceptable returns on the upside, all while working within the parameters of your 401k Plan. Countless hours of research and analysis, and decades of experience from multiple investment firms all came together in putting together the investment disciplines and risk-mitigating techniques described in this piece. In our opinion, this methodology is a great way to maximize your 401k experience. B. Customizing the Process to Fit You - The newsletter offers three modelportfolios – Conservative, Moderate, Aggressive – for you to use as guides in your own investing. The models provided are not personal investment advice, since only you know your own situation. For that reason, you are acting as your own investment advisor. Nothing in this document should be taken to imply that investing doesn't have risk. There is always risk of investment loss when you are investing. Always. What if you want to use what you see and read in the newsletter and use it as a tool as part of your own plan? That's fine. Many people do just that, and there are numerous ways to do it. The easiest way to use our process to fit your own system is to vary the amount of money the process allocates to money market funds and/or short-term bond funds during Bull Markets. For instance, what if you are less than Aggressive, but more than Moderate? You could follow the top fund recommendations of the Aggressive model portfolio, but only with, say, 80% of the account balance, or maybe even less, like 75% or 65%. What if, on the other hand, you are somewhere between Conservative and Moderate? By decreasing the amount held in short-term bond funds during Bull Markets, and allocating those funds to the Top 4 mutual fund choices, you can take a measured amount of additional risk and end up with what some would call a “Conservative-Plus” model of your own. For instance, 40% Bonds/60% Top 4 funds. You can adjust the models in 1%, 5%, or 10% increments - either up or down - based on what percentage of your portfolio has exposure to short-term bond funds – and create any risk level that is appropriate for your specific situation. Many pilots do just that. Q: Will I always outperform the S&P 500? No. To expect this would be totally unrealistic. Nothing outperforms the S&P 500 all the time. Even the S&P 500 doesn't outperform every other choice all the time. If you are a long-term investor, we encourage you to follow a process you can 1) live with through good and bad markets, 2) feel comfortable with, in terms of the level of risk exposure, and 3) that produces long-term results that get you to your destination. Focus on the 16-year chart and not on the daily market ups and downs. Q: Can I avoid all losses on a short-term basis? Again, no. The only way to accomplish that is to cease being an investor and become a saver, using guaranteed interest savings accounts. True investors will always experience some declines. This process focuses on avoiding devastating declines, while capturing major trends. While every method of investing involves some risk of loss, our process minimizes losses in look-back periods. One of the truisms of investing is that past performance does not guarantee future success. The world is constantly changing, as investors learned in 2008. Events can change suddenly and dramatically. In the final analysis, you are responsible for the choices you make. By making this process available, we are not giving individual investment advice. You are making your own decision as to how this strategy may fit into your individual situation and planning. Q: When should I make the recommended allocation changes? Making allocation changes any time from the day the newsletter is published through 8 days following publication should yield the intended results. We believe this method is stable enough to deliver results whether you buy on "day 1" or "day 8". What if you are on an extended overseas trip, or just forget to read the newsletter until much later? If you fail to make the allocation changes before day 10, you have a decision to make. If your version of the process evaluates the models every 30 days, we would suggest waiting for the next evaluation period. If your version of the process evaluates every 60 days, we suggest you make the allocation changes – just realize you will have to hold the new positions for 60 days or sell in the next evaluation period (and, of course, probably get a warning letter from the Plan Administrator). The best first choice is to make the allocation changes in the original time window. Q: Do I need to keep track of holding periods? If your plan has holding periods, for example of 60 days, and you are strictly following one of the models, the process will operate in a way that stays within these restrictions – assuming you reallocate on or near the same day of the trading month each time you trade. Ultimately, you need to stay within your plan's parameters and the responsibility for doing so falls on your shoulders. For some plans, there are no stated holding periods at all (although the plan administrators seem to change their position every day and you will quickly learn that there are indeed unwritten rules). Q: Will this process produce identical results in every 401k Plan? No. Each 401k Plan is different in the number and in the type of fund choices it provides. The quality of the investment choices vary plan to plan as well, as do holding period specifics, etc. These differences will invariably produce differing results. However, while the results will vary, the pattern of returns between the plans should be comparable when utilizing the same models. Q: Where should I put my future contributions? The easiest thing to do is to direct your future contributions into the Money Market fund and then invest the proceeds in the money market fund during the regular fund upgrading periods. If you have additional questions, please feel free to email us at airways@uspfa.org and type the word “Question” in the subject line.